In seventh pAsuram, when asked “Shall we pursue other dhEvathAs to acquire certain unseen benefits?”, AzhwAr replies “You will only get whatever you have already got praying un to them; hence, give up those aspects and surrender unto polindhu ninRa pirAn”. Subsequently, AzhwAr says “You will only get whatever you have already got from those dhEvathAs; hence, you become a servitor of emperumAn who is the cause of all and who is having garuda dhvajam (flag)”. Seventh pAsuram. Those who heard AzhwAr in previous pAsuram said “Alright. We will do that [surrender unto emperumAn]. But considering ‘these other dhEvathAs too have some greatness, we have served them; to not waste such efforts and we will wait for those efforts to fructify and finally we will surrender unto empeurumAn” and AzhwAr says “You have already seen the results of worshipping those dhEvathAs; now you do what is required”. adimai puguvadhu – become his servitor. Singing and dancing another dhEvathA who cannot be named, worshipping him in many different ways, taking shelter of him more and more through the SAsthram, running/moving around taking different births, and seen all these in front of you. You become the servitor of sarvESvara, who is the cause of all, who is having the swaying garuda as his flag, and is standing in AzhwArthirunagari, to be praised and to be surrendered unto, by all those dhEvathAs together. Odi Odi … – As said in SrI bhagavath gIthA 9.21 “gathAgatham kAmakAmA labhanthE” (having desires in the desirable svargam etc (which are mentioned in them), they attain (the insignificant, temporary) svargam etc and again and again return [to the material world]), they roamed around in this samsAram assuming many births. pala piRappum piRandhu – AthmA is eternal; achith is also eternal; the connection with achith [for AthmA] is also eternal, and through the continuous flow of karma, one assumes different types of births; without knowing the past and future, you are thinking “this is the only birth/life I have”. maRRu Or … – In this countless births, in every birth, you have worshipped other dhEvathAs. While doing so, you were engaged with all your three faculties – mind, speech and body, yet due to the shortcoming of the dhEvathA, you did not get the real benefit – there is nothing surprising in it [since they cannot bestow the real benefit]. You were deeply engaged in those dhEvathAs as ordered in his matters by bhagavAn in SrI bhagavath gIthA 9.34 “mAm namaskuru” (worship me). pal padi kAl – Did you just worship those dhEvathAs in one particular way? No, you engaged in their worship in several ways. vazhi ERik kaNdIr – Have you yourself not seen the result of worshipping those dhEvathAs as explained in SAsthram? For “palpadikAl vazhiyERikkaNdIr“, how did AzhwAr know that they have not surrendered to bhagavAn in any of their births? On seeing their current state where AzhwAr had to instruct them in this way, it is obvious that they did not surrender to bhagavAn previously. As said in brahmANda purANam “mOksham ichchEth janArdhanAth” (those who desire mOksham should approach janArdhana (SrIman nArAyaNa), had they surrendered to bhagavAn, they would have become muktha (liberated soul). Since you had surrendered to other dhEvathAs, you are toiling in this samsAram. mahAbhAratham mOksha dharmam 169.35 “brahmANam SithikaNtam cha yAchcha anyA: dhEvathA: smruthA: | prathibudhdhA na sEvanthE yasmAth parimitham palam ||” (Those who are desirous of liberation will not worship brahmA, Siva and other dhEvathAs who are highlighted in smruthis), those who are desirous of mOksham, will not follow inferior dhEvathAs; this is because – they can only give temporary results. It is said that “skandha rudhra mahEndhrAdhyA: prathishidhdhAsthu pUjanE” (worshipping of dhEvathAs such as skandha, Siva, indhra is forbidden). vaishNava dharmam “thvayAbiprAptham …“. ambarIsha was meditating upon bhagavAn. 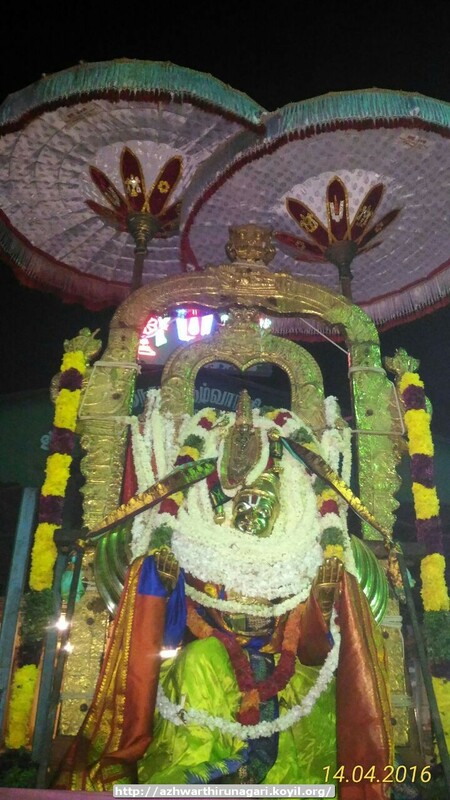 sarvESvaran wanted to know his faith; he assumed the form of indhra and arrived in front of ambarIsha on the airAvatha elephant and asked “What do you desire for?”; ambarIsha said “Who are you, who have appeared on a worm [indicating the elephant as worm, due to his disregard for the same]?”. As emperumAn assumed this form of indhra, ambarIsha did not realize that it was emperumAn himself appearing in this form of indhra along with his garuda in the form of airAvatha. ambarIsha spoke “I am performing this penance to see whoever you have taken shelter to acquire this wealth; I am not of the nature of worshipping and serving strangers; so you can leave now my lord; my salutations to you”. thirumazhisai AzhwAr, a great devotee of SrIman nArAyaNa was once stitching his cloth. At that time, rudhra and pArvathi were passing by on the aerial route. thirumazhisai AzhwAr did not care for their passing by; pArvathi became offended and told rudhra “While you are greater than all, this person is disregarding you [and thus disrespecting you]”. rudhra said “He appears to be a devotee of bhagavAn” and both said “Let us find out who he is” and approached him. rudhra asked “What is this? Humans when seeing the dhEvas (celestial beings), will worship them and ask for boons; on the other hand, you, on seeing us, have not respectfully folded your stretched legs, and did not render any service and did not ask for any boons”. thirumazhisai AzhwArs said “Alright. Can you give mOksham?”. rudhra replied “I have no capacity to give that. That can only be accomplished by the mercy of bhagavAn by surrendering unto him”. AzhwAr further asked “In that case, can you postpone the death of a person who is suppose to die today?”, rudhra replied “That is also not possible for me to do since it is based on one’s karma (puNya and pApa)”. AzhwAr sarcastically said “That being the case, can you mercifully make the thread go through the path of the needle?”. rudhra became very angry and opened his third eye on his forehead and AzhwAr showed many eyes on his foot in response [which made rudhra and pArvathi understand the greatness of AzhwAr and they respectfully left that place after apologising to AzhwAr]. kUdi … – Those dhEvathAs whom you have surrendered unto, will accept your worship and then they will go and worship emperumAn. At least, by seeing their acts, you surrender unto emperumAn; irrespective of the one who severed the head (rudhra) and the one who lost the head (brahmA), as village heads who have great enmity with each other, yet have common danger, all of those dhEvathAs will surrender unto bhagavAn only. Though they have mutual enmity, they will come together when it comes to worshipping emperumAn. Adu puL kodi – Victorious garuda flag. Adu – victory. One who has victorious garuda as/in his flag. Also explained as – the bird (garuda) who is swaying/dancing out of joy of being the vehicle of sarvESvaran. To destroy the enemies of devotees, one need not hurt sarvESvaran; emperumAn just need to remain on the shoulders of thiruvadi (garudAzhwAr). One who is known as “garudadhvaja”, “garudavAhana” is mOkshapradha (one who can bestow mOksham). Adhi mUrththikku – As said in chAndhOgya upanishath “kAraNam thu dhyEya:” (meditating upon the one who is the cause of everything). jagathkAraNavasthu (one who is the cause of universe) is the one who is to be meditated upon and worshipped. sarvESvaran who is the one who can bestow mOksham and one who controls everyone. adimai puguvadhuvE – It is the duty of each AthmA to serve bhagavAn. You need not do anything [additional]; all you need to do is offer his belongings [our self, body etc] to him. While he considers us as “my belongings”, instead of you considering these to be “my belongings”, you should accept that these are “his belongings”. “adimai puguvadhu” is an order/rule to follow, and “kaNdIr” indicates that you have seen the result of surrendering to other dhEvathAs; so, AzhwAr says “now you try surrendering unto bhagavAn”. When bhattar explained yayAthi charithram [yayAthi being a very pious king ascends to svarga to share the throne with indhra and he was tricked by indhra to fall from that position], piLLai vizhupparaiyar and AppAn thiruvazhundhUr araiyar asked “Which concept of vEdham and its elaboration, is explained in this incident?”. bhattar mercifully explained “Inferior dhEvathAs, even when someone prays to them and achieves some greatness, they cannot tolerate that and only sarvESvaran considers ‘the greatness achieved by others is as good as greatness of himself’ and hence, this incident explains that the other dhEvathAs are not be surrendered unto and only sarvESvaran is to be surrendered unto”. As said in SrI rAmAyaNam bAla kANdam 31.4 “imausma” (SrI rAma to viSvAmithra – we are available to execute your orders), only emperumAn can assume very humble position. [What about yAdhavas who were surrendered to krishNa and still did not get liberated?] On hearing that the yAdhavas [krishNa’s clan] killed each other using wild grass, it was asked with fear “there is nothing that krishNa has not done for them; yet, in the end, they killed each other; we think that our surrender to bhagavAn also may lead to this end” and [nampiLLai] mercifully explained “Do not fear; we will not meet with that end; they simply considered krishNa as ‘my friend’, ‘my in-law’ and so on and liked him only due to their bodily relationship with him and so their relationship with him ended with their current lives; but as we are knowledgeable about our true nature and surrender unto bhagavAn thinking that we should achieve the real goal, we will achieve the eternal result”.